Meet the PocketRocket 2 Mini Stove Kit. Plus, two delicious boil-only recipes. Bikepacking season is knocking. Time to gear up. 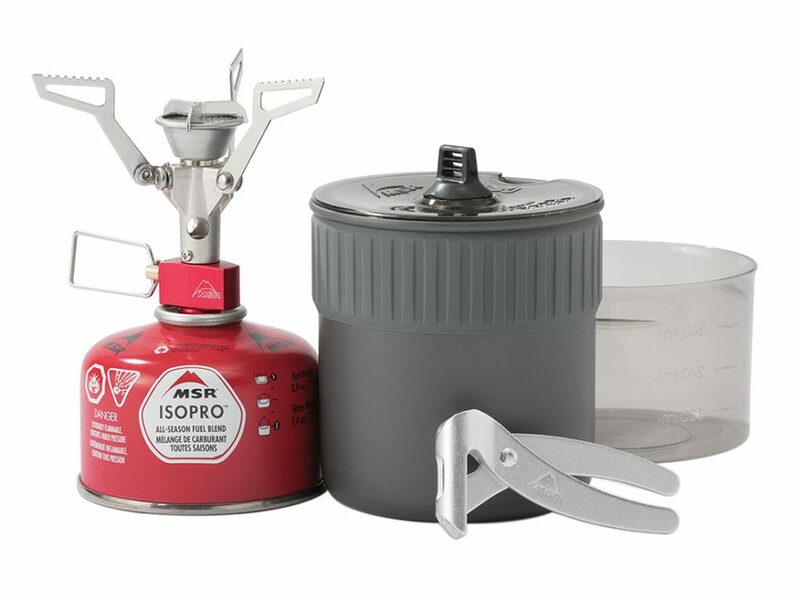 To help, we’re examining why MSR’s PocketRocket 2 Mini Stove Kit is your ultimate cook-and-eat ally for such pursuits. Then, we set you up with two bikepacking-friendly recipes to fuel your next adventure. 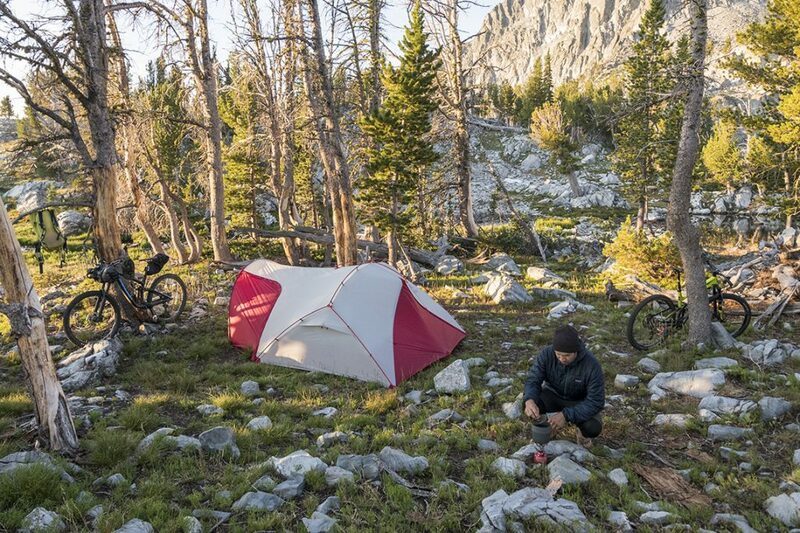 For bikepackers, the PocketRocket 2 Stove Kit packs big performance into a tiny package. For starters, it’s hardly bigger than a mug—perfect for boiling just the water you need for one hot meal, or a cup of coffee. All components you need—the stove, a 4 oz fuel canister, the pot lifter and an extra bowl—nest inside, or on, the 0.75 L pot. Conveniently packed, this whole kit slips easily into a saddle bag, saving precious space and reducing bulk. 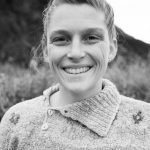 Minimizing bulk is critical when bikepacking, particularly when you’re pedaling along tight, wooded singletrack or sailing down steep, exposed ridgelines. Less bulk equals greater stability. In addition to shedding bulk, this stove kit cuts weight. Your pedal power comes solely from you, so less weight means you can cover more miles, faster. Plus, a heavy bike is a hazard in techncial terrain. 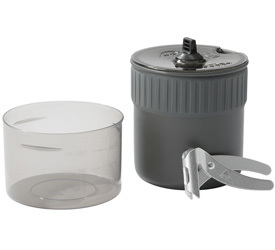 For a mere 278 g (9.9 oz), this kit provides your stove, cooking pot, and a bowl (a luxury in the backcountry). Don’t need the bowl? Leave it behind and drop a few more grams. All considered, that’s a high gear-to-weight ratio, providing the essentials you need very efficiently. 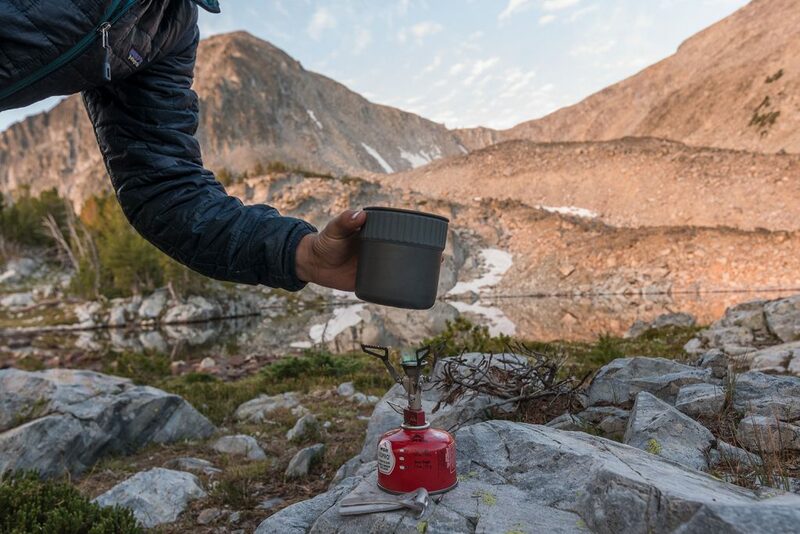 Made of hard-anodized aluminum, the pot is both light and durable—key when your gear gets thrown around, or, dare we say it, you take a spill in a rocky section. The stove clocks in at a scant 73 g (2.6 oz). Rivaling the weight of alcohol stoves, the PocketRocket 2 offers greater fuel efficiency and cold-weather performance than spirit contraptions, making it safer and more reliable. Reliable—and fast. Boasting a 3.5 minute boil time, the PockRocket 2 micro stove is speedy, letting you make that hot meal quickly after a long day in the saddle, and then transition to calm of the evening feeling satisfied. That speed comes with an incredibly tiny packed size. This is thanks to the stove’s double-hinged folding pot supports. Stamped from stainless steel, they accommodate a wide range of pot sizes, making the PR2 small, yet versatile enough for trips when larger pots are needed. The PocketRocket has long been celebrated by the fast-and-light crowd for its ultralight power, engineered to deliver on your minimalist (sufferfest) trips. On such adventures, multifunctional gear also reigns supreme. That’s why we built the pot to play double-duty as both your cooking and eating and drinking vessel. Its lid features ports for straining ramen. And its insulated grip allows you to hold it while it’s still cooling. Finally, the discreet bowl adds a second vessel for a companion, or for that cup of coffee while you make a “giant” pot of gourmet oatmeal the morning before a massive climb. Regardless of the elevation gained or miles pedaled, getting the calories you need is crucial to a successful bikepacking trip. The PocketRocket 2 Mini Stove Kit was built for such adventures, delivering the ultralight efficiency you need to move fast and light on epic wilderness journeys. These recipes make two servings. 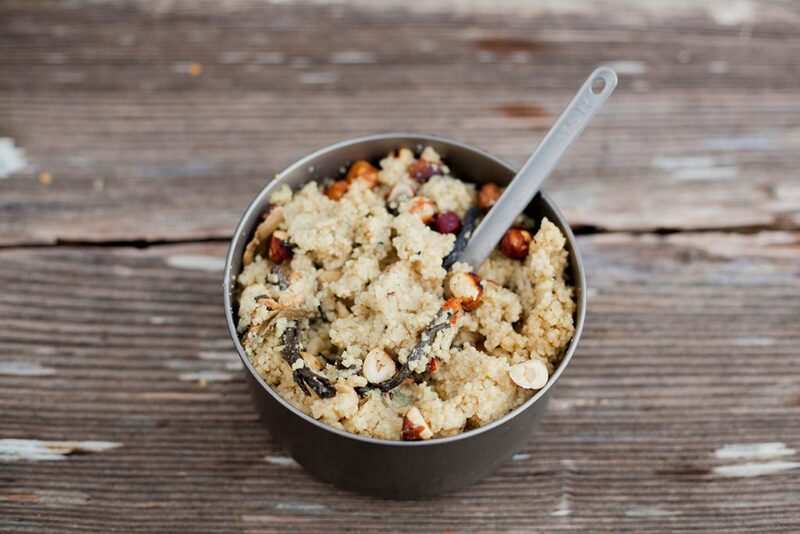 Cut the portions in half to make one serving in your solo pot, or bring the Trail Mini Duo Pot for two people. 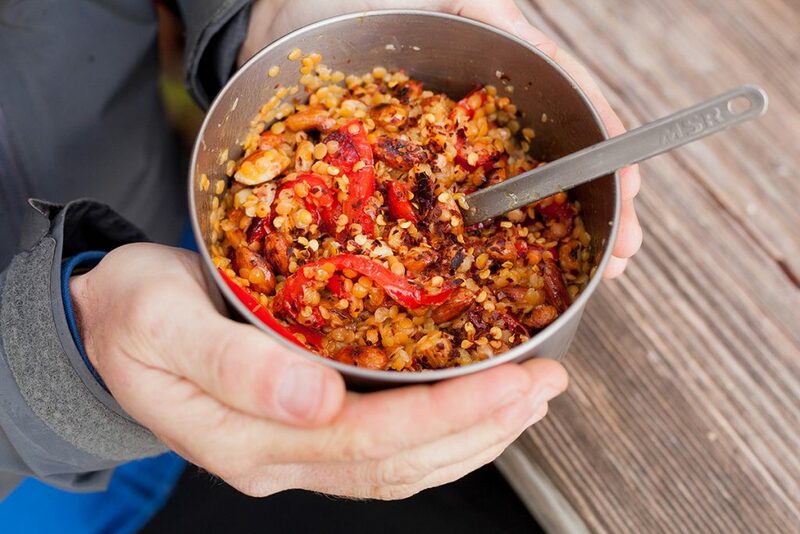 Red lentils are one of our favorite things to make on bike trips because they are hearty and cook up pretty quickly. Just bringing the water to boil and then letting the lentils soak in the hot water helps them to keep their shape and just a little bit of crunch. If you want a straight “boil only” recipe, just chop the red pepper and add to the lentils with the rest of the ingredients. Mix the sauce and place in a sealable bottle. If you don’t have toasted almonds, toast raw ones in a skillet, until they have darkened. Roughly chop and place in a sealable bag or container. 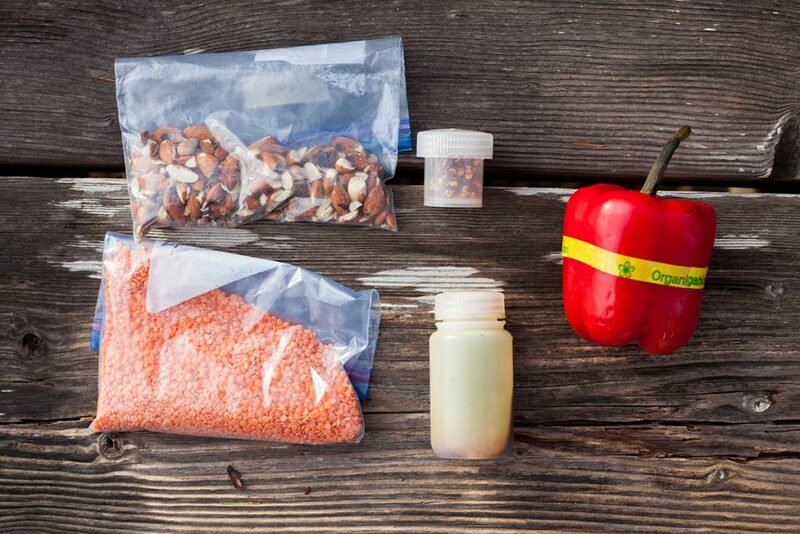 Transfer the red pepper to a bowl and fill the pot with two cups of water, then add the lentils. Place on the stove and bring to a boil. When the water is boiling, remove from the stove, cover and let sit for at least 5 minutes. Add the chopped almonds, garlic, red pepper and sauce. Mix together and serve, sprinkling with red pepper flakes to taste. 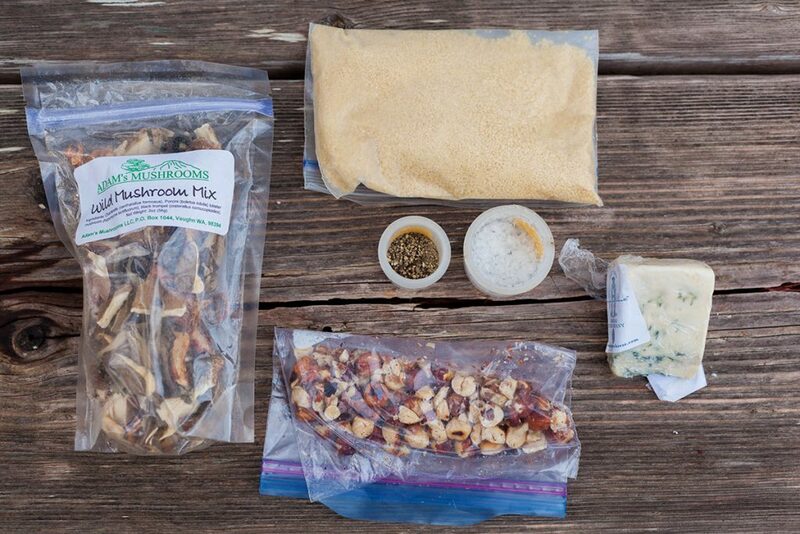 Dried mushrooms are lightweight and add a lot of flavor to camping meals. The standard way of cooking with them is to let them soak first, in order to rehydrate. It’s worth bringing a small container of olive oil to drizzle over this, along with some salt and pepper. If you don’t have toasted hazelnuts, toast raw ones in a skillet, until they have darkened. Roughly chop and place in a sealable bag or container. If you have the time: use your hands to break the mushrooms up into smaller pieces, place in the pot along with the water, cover and let soak for about 15 to 20 minutes. When ready to cook, bring the water to a boil. Once it has boiled, remove from the stove and pour in the couscous. Cover and let sit for an additional five minutes. Remove the cover and fluff the couscous with a fork. Cut the blue cheese in small bits and add in along with the toasted hazelnuts and chopped garlic. If you have some with you, drizzle with olive oil. If you’re wanting dinner in a hurry: use your hands to break the mushrooms up into smaller pieces, place in the pot along with the water. Place the pot on the stove and bring the water to a boil. Let boil for about 5 minutes. Remove from the stove and pour in the couscous. Cover and let sit for an additional five minutes. Remove the cover and fluff the couscous with a fork. Cut the blue cheese in small bits and add in along with the toasted hazelnuts and chopped garlic. If you have some with you, drizzle with olive oil.